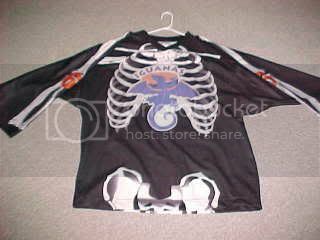 Since my first ugly jersey post from a couple of weeks ago, I've managed to find enough god-awful jerseys-- through people who left comments, or from message boards that linked here, or just from looking around in general-- to make a whole new post. 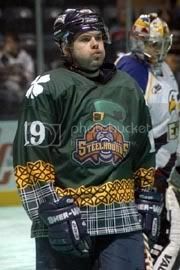 Ziggy Palffy played on this team! 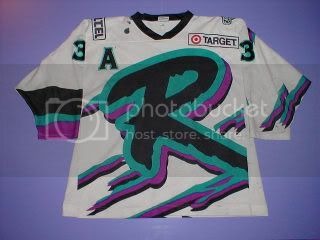 Finally, the coup de grâce-- this gets my vote for the stupidest-looking hockey jersey ever. 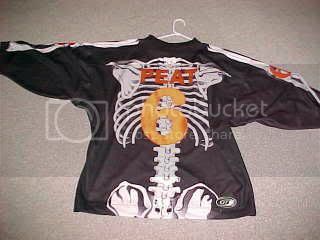 I think this jersey has been posted on every message board known to man. 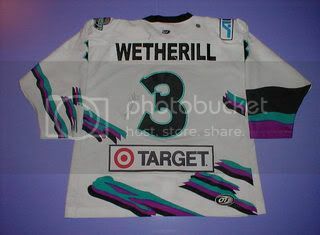 You got one that's worse? 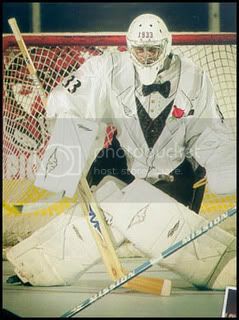 Once again, I love the tuxedo jersey. 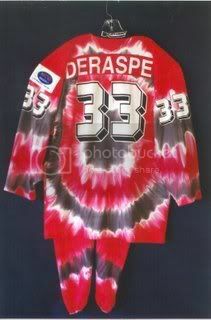 It's even better on a goalie! No, sir-- I don't like it! 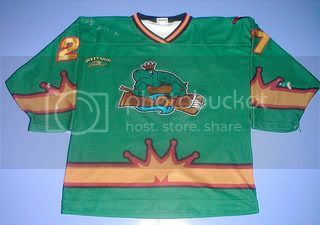 That Mallards jersey may have been posted on every message board known to man, but I've never seen it. And I wish you hadn't brought it to my attention. 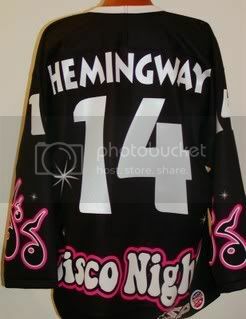 Roenick would've loved the Disco jersey, obviously. 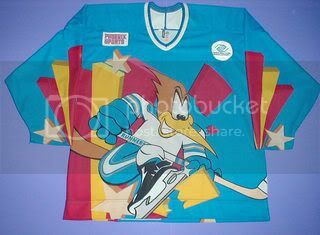 Personally, I'd shell out money first for the Tulsa Oilers jersey. There's something very George Orwell about it. 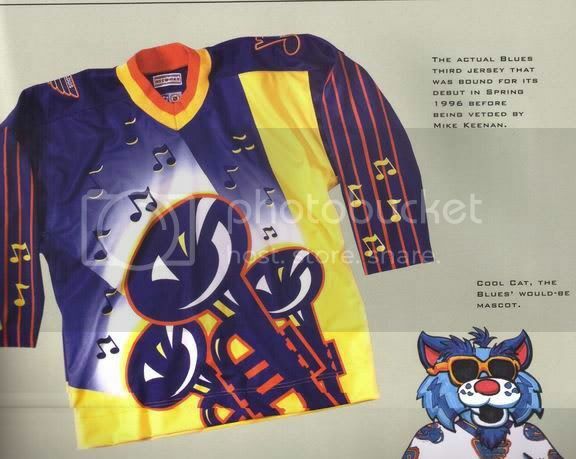 And the St. Louis Blues alternate is AWESOME. 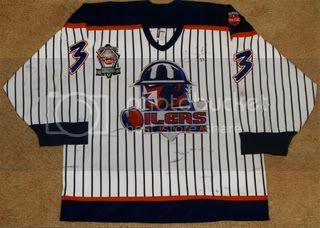 That Tulsa Oilers jersey makes my eyes go screwy. 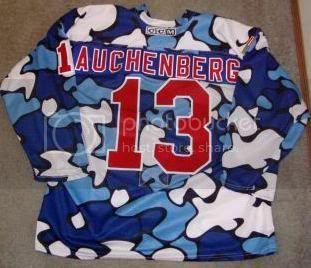 Hmmmm...bad jersey or brilliant strategy? 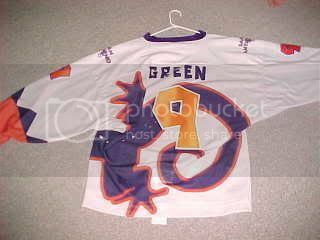 third one down, Dayton Gems. The Houston Astros effect! 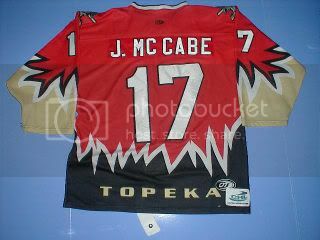 That site is a treasure-trove of ugly jerseys! 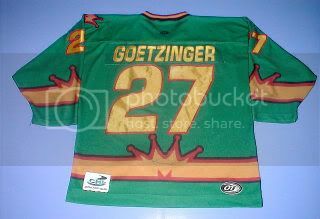 I have a few old Russian jerseys that look similar to that Dayton Gems one-- coarse, flimsy mesh with a screen-printed design on them. 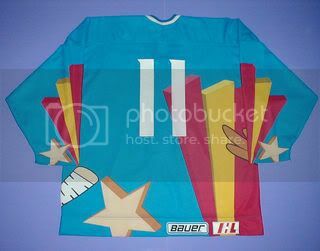 I'm surprised to see any support for the St. Louis Blues jersey. 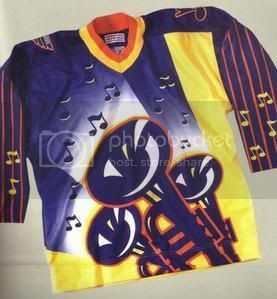 It's not just the horns (and the New Orleans Brass tried that, too); the sleeves are terrible. 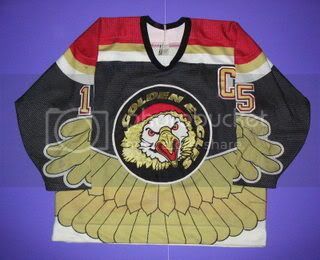 Just picture in your mind the team skating around the ice with those jerseys on. That's a headache! 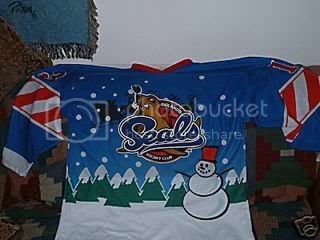 Bear in mind Alanah is a Canucks fan and is thus warped by years of strange jerseys. 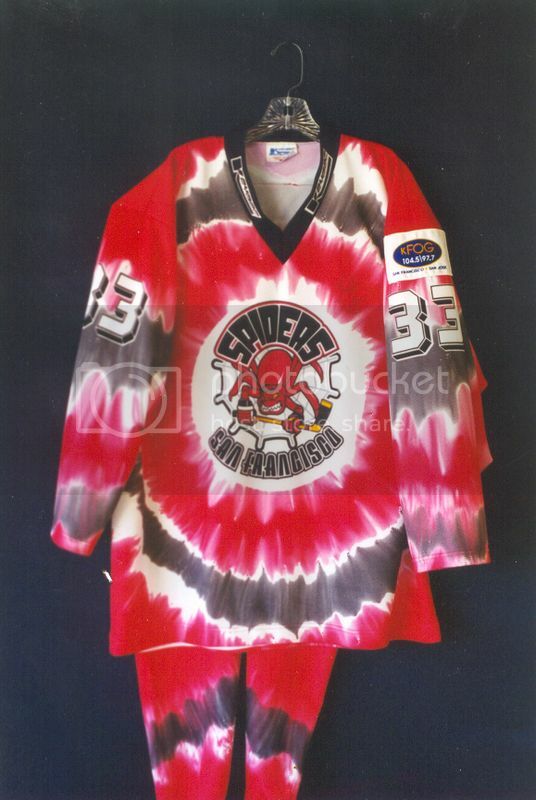 Once again, I LIKE the Rio Grande Valley jersey. They're weird but kinda fun. 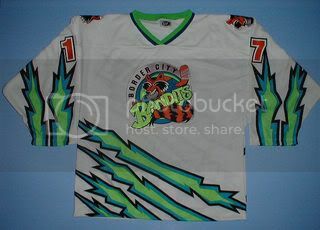 Those Quad City things, I agree, are mind-destroying. 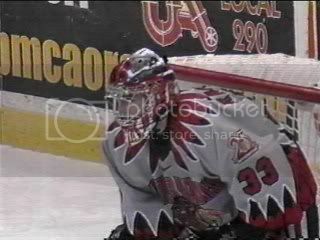 Though (unlike most people) I actually liked the so-called "Orca" jerseys. 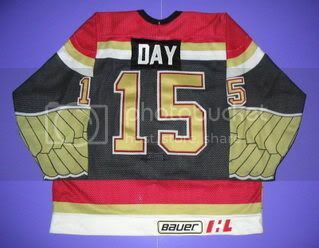 And, also unlike most people, I think the Canucks' "Skate" jersey is one of the worst jerseys ever... worse than the Duraflame Log "V" jerseys, even. 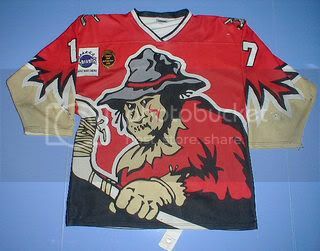 I dunno -- looking at this photo, it's hard to imagine anything on earth worse than those "V" jerseys. Wow-- Stan Smyl and Gerard Depardieu, separated at birth. 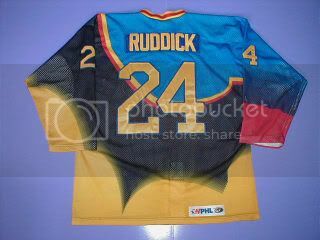 Mrs Brushback -- I'm thinking the answer to your question is "bad jersey". The strategy side of it can only go wrong. Before you know it, Tulsa boys are accidentally making passes to the ref. Or simply going blind trying to look at their teammates. 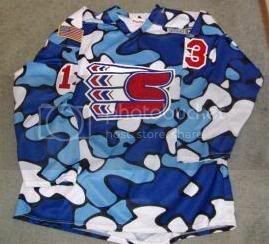 But still, there is something to be admired about creating something so poorly conceived. 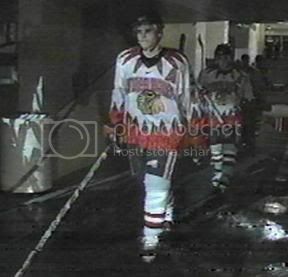 I don't know-- if they're making passes at the ref and peeking at their teammates, I'd start to wonder about them. Holy hell. Just checked those links and Stan Smyl really IS Gerard Depardieu. 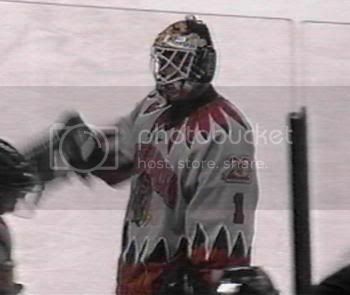 Freaky. "I don't know-- if they're making passes at the ref and peeking at their teammates, I'd start to wonder about them." Oh man... I stared at that for 5 minutes before I got it. 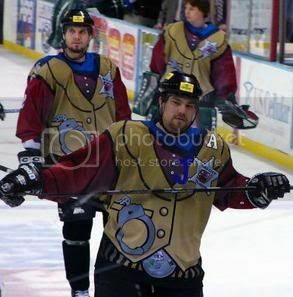 I find these uniforms very interesting. 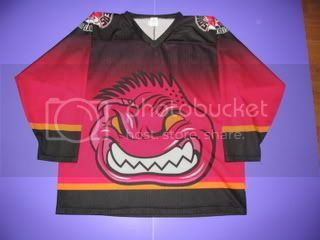 Tackey as most of them are -- they are still a slice of hockey history -- actually something fairly unique to hockey. 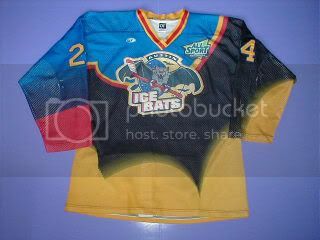 The Icebats uniforms are interesting and attracted my attention since I heard that this is the new team of former Pack blueliner -- Terry Virtue. 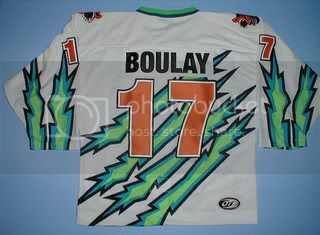 It would be interesting to know what KOVALCHUK's girlfriend thinks of all these funky jerseys. 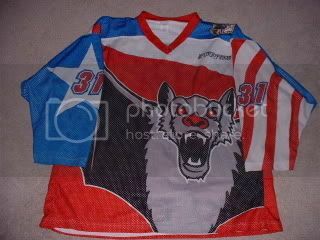 The Ice Bat on the front actually kind of looks like Terry, in a way. 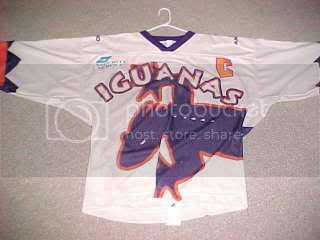 quint sure talks like a Manchester Monarchs fan. I suggest he get no closer to New Hampshire than, say, Worcester, MA and surrounding areas. 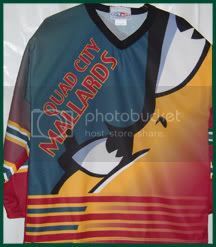 Those Mallards players look like they KNOW people are laughing at them. I'm actually sitting here feeling bad for those guys and I haven't a clue who they are. 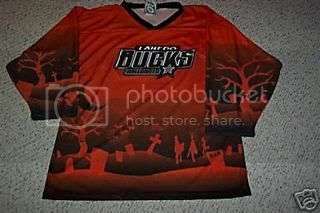 You're right, and it wasn't until a month or so after I posted the photo that I saw a full-sized version of the photo on a message board, and I could see the roller skates on the players' feet. 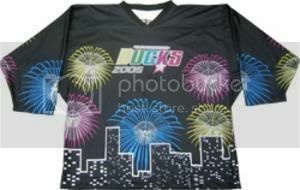 Almost all roller hockey jerseys are screwy-looking, but the tuxedo one is still fun to look at. 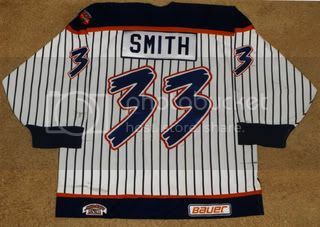 Would You Wear This Jersey?